卧虎山长城Wohushan (Crouching Tiger Mountain) Great Wall is located in 北京Beijing's 密云县Miyun county. This section of the Great Wall straddle on the rocky mountains of 卧虎山Wohushan (Crouching Tiger Mountains) — so named because two distinct peaks resemble a pair of tigers, one looks up and the other bends down. Wohushan is part of the 燕山脉Yanshan mountain range, which stretches across the northeast borders of Beijing in a east/west direction like a stone curtain. Gubeikou pass cuts through its midsection, thereby creating the 蟠龙山Panlongshan on its east, and the Wohushan on its west. 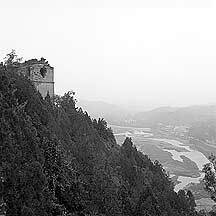 The Wall winds through Wohu Shan for 13.6 kilometer; along the way, 20 towers decked its spine. Constructed during the eighth year of the 洪武Hongwu (1376) reign in the 明朝Ming Dynasty (1368-1644), both the east and west Wall were intended to fortify the pass against the rising threat from the northeast. It is the first gateway into the capital city. From this tower you have a wide view of the area, which include the Gubeikou town, the 潮何 Chao River and reservoir, and much of the Panlongshan Great Wall on the opposite side. The difference between signal towers and enemy towers is that signal towers are generally independent towers that are not connected to the main wall and are situated at a little distance from it. 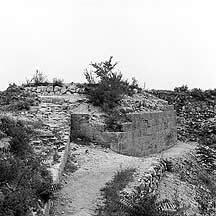 But practically, many enemy towers also functioned as signal towers, especially the Ming Wall. 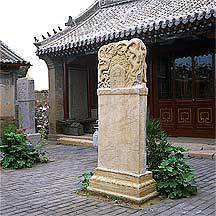 The memorial tablet in the foreground was carved for the Qing emperor Qianlong to commemorate his visit to a temple somewhere here. This temple was constructed a year ago (2005) and claim to be on the original spot. The same Buddhist temple from further up the Wall. 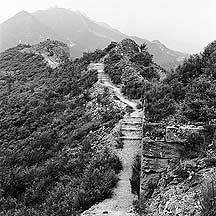 Wohushan great wall does not receive much reconstruction. On the base of the walls are giant blocks of hard rock which were likely cutted from this rocky mountain itself. Until there are enough tourists here, repair and reconstruction of this Wall will not happen. Depending on who you are, this may be good or bad. The exposed side of the massive Wall. The view of Wohushan Wall from the highway below. Arts and Crafts that I bought along my travels. See 吐鲁番Tulufan's well-known attractions -- 苏公塔Sugonta (Emin Minaret), 高昌城Gaochang Ruins, and 火焰山Huoyan Shan (Flaming Mountains). While I was in Gubeikou, I did not plan on climbing this section of the Wall. 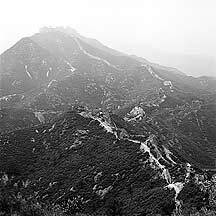 I wanted to get up the Panlongshan Wall and hike to 司马台Simatai. But after hours lost in the valleys while searching for a path up to the Wall, it became too late so I decided to stay a night in 古北口镇Gubeikou town and climb the Wohushan Wall in the meantime. The Crouching Tiger Wall is just across from the town's entrance gate. After finding a room and dropped off some stuffs, I went out to the highway and walked across a stone bridge that spans the 潮河Chaohe river. 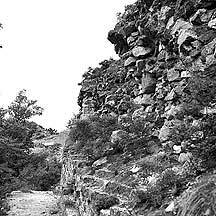 A road leads to a large vertical boulder with the carved characters "卧虎山风景区"(Wohushan Scenic Area). Right at the ticket booth was a complex of houses — hotel rooms with a restaurant — which I passed without a ticket, because it had closed for the day. A narrow path of stone steps leads up the mountain. I had about 2 hours of good light, so I climbed quickly. The stone steps soon faded and turned into a earth path. I followed onward and bumped into a temple a little later. On the outside a board introduced the place as 吕祖庙Luzhumiao Temple. Through its door I saw a large stone tablet with the usual pair of interwined dragons carved on its top portion. I went in and met the Buddhist master of the temple. It was a woman in her mid-40s. And she was dressed in the elaborate orange robe that reminded me of the Tibetans. She saw that I was interested in the tablet and came over to me. "乾隆Qianlong emperor (清朝Qing Dynasty (1644-1911)) built the 万寿寺Wanshousi (Longevity Temple) here to celebrate his mother's 60th birthday. This is written on the stone". "Is this the original temple?" "No, two years ago (2004), the local government funded the construction of this place." "But the tablet is original, is it?" "Yes." I looked around and asked if I may take a few photos of the area. She nodded and then went back to one of the rooms to burn incense. The temple was small, with a central courtyard area and a few small rectangular rooms around its primeter. I took a few quick shots and was prepared to leave when she asked if I wanted to take a picture of her most important room, the room she was. She stood just outside of the doorway; and inside, the bright golden candlelight and thick incense smoke produced an unearthly aura around the finely-robed and multi-armed 观世音菩萨Guan Yin (or Guanyin, a Bodhisattva) and her attendants that lined the table. I declined, saying that it was not good to photograph. "Why?" she suddenly asked, "is it because it is not good blessing?" "No, no" I replied slowly while I thought out what was on my mind, "because Buddhism has no boundary, my action of taking this picture is unnecessary." She smiled, then said "it is not common that we meet today, so I like to give you a few books." She went into the room and came out soon with three books. I thanked her generous offer, but declined to take them, explaining that I had too much luggage already. But she insisted, "these are true Buddhist books, I like you to have them." I have no choice but to accept them, and became their guardian for the rest of my stay in China. As I examined the books she suddenly asked if I had been to 拉萨Lasa (Lhasa). I said no; however, in 承德Chengde I saw a few large Lasa style monasteries (八外庙Eight Outer Monasteries, one of which is the 普陀宗乘之庙Putouzongcheng, a very large monastery that resembles 布达拉宫Budalagong (Potala Palace) in 西藏Xizang (Tibet)), but did not go in. She was startled to hear that I did not go in and asked for the reason. 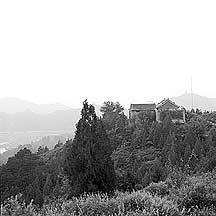 I explained that at the time I saw the distant temples while hiking through the city wall atop the forested hills; it was late in the evening, and I had to leave the next day. "It was enough to see it with my own eyes, I will go in the next time we meet." I said, hoping it will satisfy her. She nodded. I saw the sunlight diminishing, I must hurry on my way. "From this way up, the Wall is well-preserved. Go now." She said and placed he left hand on her heart and nodded slightly. I thanked her again for the books and awkwardly picked up my left hand, and sort of waved, then left quickly. At 18:30 I had about an hour of good light. I soon reached a height where I saw the endless Wall spaning the mountain crests. Of all the sections of the Great Wall that I had touched this must be the mightiest. Its base is founded on meter long and half meter thick stone blocks. On top these are large bricks that stacked into the walls. And between the walls large stones and pounded earth fill in. In its youthful days, a layer of bricks would cover its filled body, forming the floor. But now all that is gone. Large chunks of the Wall had been blown apart. The round towers are now only a man's height. Still, the undying remains carry itself up the lofty rocky mountains without a care. And its endurance symbolizes its might. Because I had only a short time and I wanted to see what was on the other side of the mountains, I ran much of the way. One of the mountains loomed up to the sky. This must be one of the tigers, I thought. Should I climb up? I turned back. I only have black and white film to spare, and even that I need to conserve for the other sections of the Wall. And it got too dark for photography. I didn't want to risk ahead without proper preparations. I ran back. It will be another hour before I get down to the town. On the way I went back inside the temple to take a careful look at the stone tablet again. Inevitably I bumped into the temple master again, who greeted me in her Buddhist manner. With her were two older women who brought her bottled waters from the town. They were preparing to leave, so I decided to walk down with them. After the master carefully locked the main door, we headed down. Along the way, she told me that she had been at the temple for the greater half of a year, and maintained it all by herself. "All just yourself here," I was surprised. She smiled, "I have many students — both eastern and western. Some stayed a few days and some a few months." As she spoked she coughed a little. "At this moment I have a student, a westerner who is a psychologist, that came here for business. He had been learning Buddhism with me for the pass month. He stays in the hotel below." She turned to me and checked into my eyes, "do you know what sort of place is this hotel?" I looked dum. "This is where the Wohushan officials live. In the past, the royal members lived here." I looked a little dummer. I turned back to see how her attendants were doing. So far they followed behind without much sound. Master looked ahead and continued, "my students all live down there. They came from 台湾Taiwan, 香港Xianggang (Hong Kong), and foreign countries. They all wanted to stay down there, but the hotel is too small. So, very soon it got filled." But the town has plenty of guesthouses, I said. "They all wanted to live in the palace!" she let out the words with a slight cough. "The 风水Fengshui here is good. Before the Temple is 潮河Chaohe river, and behind are high mountains. I went to 北京Beijing to teach for a month and my nose got sick. I came back to the temple and prayed for a few days and all was well. Beijing people use too much water. 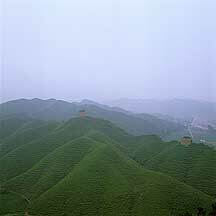 These past few days I had been praying, so now there is rain; otherwise, the Chao River would had be dried up by now." I was shocked. There cannot be rain tomorrow when I will be climbing the eastern Wall. "This river flows straight to the 密云水库Miyun Reservoir. It is the second largest man-made reservoir in the world — do you know that?" Now I looked dummest. Again, I looked behind to check the two older women. "These two friends behind us bring water up to the temple for me. I feel awkward, but can only give a small fee for their service." Once we were down on the foot of the mountain, I asked the master if she lives in the temple. "No, the temple has room. So this hotel kindly provided a room for me, and I have beening living here for the past 3 months already." It was by now dark, and the master had to rest. So I thanked her again and left. Afterwards, I crossed the bridge and went in a park, which was just to the left. 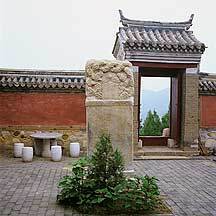 The small park has an interesting name: carved on a stone are the characters, "健身公园" (Body Building Park). This does not mean body-building to increase muscle size, but exercise to improve health. I sat on a rock and watch the folks grouped together and danced under the moonlight. 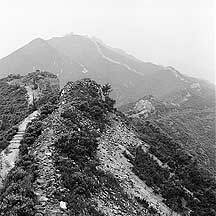 Tomorrow I will get up to the 蟠龙山长城Panlongshan Wall. From 北京市Beijing city's 东直门汽车站Dongzhimen's bus station, take the bus to 密云县Miyun county. From the county, take a minivan to Gubeikou. The Gubeikou town is right beside the 101 national highway, connecting Beijing city and 承德Chengde. So any bus to Chengde will also pass by its door. 卧虎山长城Wohushan (Crouching Tiger Mountain) Great Wall is just across the stone bridge over the 潮河Chaohe river. 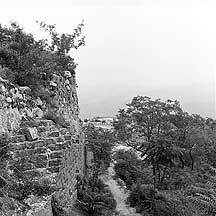 There are a lot of guesthouses in the 古北口镇Gubeikou town where this Great Wall is located near. Most are in the low-budget category. 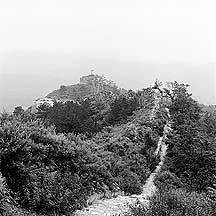 However, for the comfort-seeker, there is one right on the entrance to this 卧虎山Wohushan (Crouching Tiger Mountain) Great Wall. It looks like a courtyard style complex with a classy restaurant inside. But I heard that it is always booked — by famous psychologists, wealthy students, officials and celebrities. So, good luck.